Perhaps the most familiar recipe for spaghetti is cooked spaghetti pasta with a thick tomato or Bolognese (meat) sauce, and topped with grated Asiago, Parmesan or Romano cheese. 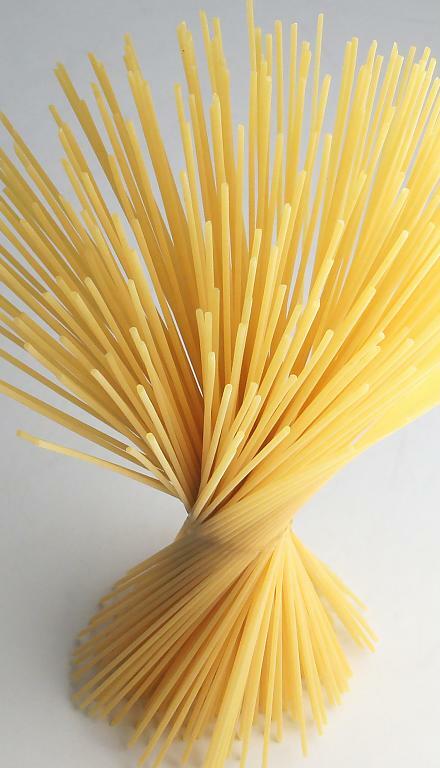 But there are lots of quick dishes made with spaghetti that are worth the try. 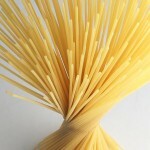 Note that many spaghetti recipes can also be made with linguini (thin, flat pasta) or angelhair pasta. This recipe is raw (except for the cooked spaghetti), well suited for a hot summer day when it is too hot to turn on the stove. I love that the brie melts when the raw ingredients are tossed with the warm pasta. You can remove the white mold from the brie before adding it to the other ingredients, but I prefer to leave it on as I like its flavor. Garlic is my best crop, and roasting is one of my favorite ways to use it; it gets so soft, smooth and sweet. I like to use whole grain pasta when available, but not all whole grain pasta is created equal. If using wheat, be sure to select a good brand, that uses whole durum wheat flour. Most ‘white’ pasta is made from semolina, which is made from durum wheat, so if using white pasta,, look for ‘semolina’ in the ingredients list. This recipe is adapted from the Daily InterLake, Wednesday Aug 28, 2008 (originally from the Washington Post, by Patrice Kehoe (1)). Serves 6. Ideally, the basil, garlic, and tomatoes are fresh from your own garden, or at least from a local grower who does not use pesticides. Otherwise, choose Organic. If you’re making this in the winter, you can use Organic canned chopped tomatoes, but the result will not be as good, even if you canned your own bounty. This sauce can be stored in the refrigerator in an airtight container for up to 3 days. Preheat oven to 4250 F. Remove outer papery covering from head of garlic. Slice off the top of the heat so most of the clove tips are exposed. Place in a small baking dish or “bowl” of aluminum foil. Drizzle 1 tsp olive oil over the garlic. Cover baking dish (or fold foil over garlic to enclose it). Roast 45 minutes in preheated oven. Remove to trivet to cool enough to handle. Other Prep: Cook pasta according to directions on package. While pasta cooks, coarsely chop tomatoes; place in large serving bowl. Stack basil leaves neatly; roll tight; cut crosswise into very thin shreds. Add to bowl. Squeeze soft garlic from half the roasted head; add to bowl. Tear or cut brie into chunks (discarding rind, if desired). Add to bowl along with oil to taste. Season with salt and pepper. Toss to combine, placing bowl on a warm surface of the stove top (or set bowl inside another bowl of hot water). Finish and serve: Drain pasta and toss with sauce until the brie melts. Add grated cheese and toss lightly. This entry was posted in Dairy, Fat or oil, Herbs, Onion family, Pasta, Raw, Uncategorized, Vine veggies and tagged basil, brie cheese, cheese, garlic, olive oil, pasta, tomatoes. Bookmark the permalink.